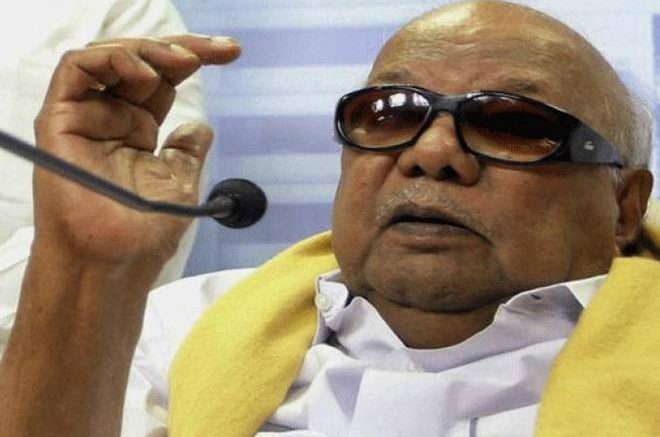 DMK President M. Karunanidhi was admitted to Kauvery Hospital again on Thursday night due to throat and lung infection, said the hospital. In a statement issued here the hospital said Karunanidhi was readmitted with breathing difficulty due to throat and lung infection. ‘The treatment has been initiated to clear his infection. He is stable and is being treated by a team of doctors,’ the statement said. Karunanidhi was readmitted only a week after his visit to the hospital. DMK sources told TNM that his situation is stable and he was not critical unlike social media speculation. “At his age, having an infection can be worrisome, so, he was taken to hospital,” a source close to Karunanidhi said. The DMK chief has reportedly been unwell for many weeks now. He had announced in October 2016 that MK Stalin will take over the party after him. 7 Comments on "DMK Chief Karunanidhi admitted to hospital for throat and lung infection"